From pulpits and street corners, doomsday preachers shriek about the horrors awaiting those who walk in darkness. The druids, roaming the lands under their protection, whisper prayers to the Fair Folk to keep the dark ones at bay. Even the witches use symbols to ward against the attention of the malevolent spirits, those fallen faeries known as devils. Every religion, large and small, claims there exists a place of punishment, a great repository where the souls of the damned face suffering beyond description at the hands of fiendish tormentors. This place has many names, such as the Darkness Below, the Nether World, the City of Graves, or Torment, but most know this place as Hell. Hell would not exist without mortals. It is a place of purification, where souls stained by evil can find release from their burdens through the cruel ministrations of the warped faeries living there. The process of purification does not come easily but involves extraordinary pain; thus, the devils have amassed a wide range of torture techniques for this purpose. Hell is also the staging ground for the devils’ efforts to corrupt souls in the mortal world. In this place sustained by great magic, devils can draw power to tempt mortals, to bestow on them wondrous gifts in exchange for ownership over their souls. Devils find mortals’ rapid descent into darkness hilarious—even more so when it hurts other people. However, as much as they enjoy ruining mortals’ lives, devils depend on them for survival. Should mortals ever pass from the world, so too would the devils. For this reason, devils have a keen interest in the present troubles blighting Urth. The Demon Lord’s shadow reaches even into the bowels of Hell, and its denizens stand ready to contribute to the struggle to save the world. 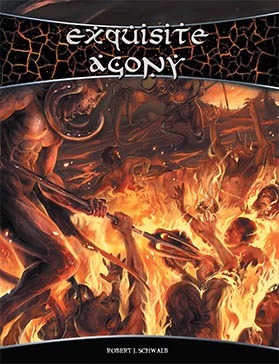 Exquisite Agony lays bare the secrets of Hell and its inhabitants, offering GMs new inspiration for creating adventures and campaigns that explore themes of corruption and redemption, take groups into the depths of darkness, or test the player characters’ ability to resist the power Hell offers. As with other sourcebooks, you’ll find a mix of story and mechanics to support these goals. Players can also find more options at the end of this supplement, including a new ancestry, a selection of new paths, and new spells. Since the material in this book injects a heavy dose of evil into the game, it might not be appropriate for all groups. Be sure to consider carefully before you introduce these options into your game. Buy Exquisite Agony in Print and PDF at Schwalb Entertainment and DriveThruRPG!